Julian Alaphilippe (Quick-Step Floors) has won the tenth stage of the Tour de France. The rider attacked at the second climb of the day and remained in front until the last moment. The tenth stage of the French race was the first glimpse into the Alps with a route of 158.5 kilometres that featured three climbs of the first category, one of the fourth and one 'hors category'. The day started with an escape of 21 riders that included Yellow Jersey wearer Greg Van Avermaet (BMC), Robert Gesink (LottoNL-Jumbo), Rein Taaramäe (Direct Energie) and Peter Sagan (Bora-hansgrohe), which got an advantage of more than six minutes over the pack. The only hors category climb of the day was first completed by Julian Alaphilippe (Quick-Step Floors), who attacked from the peloton, overtook the escape and went on his own for a while. The rider was caught by the chasers on the descent while in the peloton, Chris Froome (Sky) suffered a puncture on the climb. With 36 kilometres to go, Lilian Calmejane (Direct Energie) attacked from the front group and build a gap with the rest. At the same climb, Warren Barguil (Fortuneo-Samsic) also jumped from the peloton but was reeled back in a few kilometres later. In front, Taraaramäe took the lead before the penultimate climb of the day but was soon joined by Alaphilippe, who took the KOM points taking the lead in the mountain classification. On the descent, the Frenchman went away on his own and Taaramäe stayed behind chasing him. 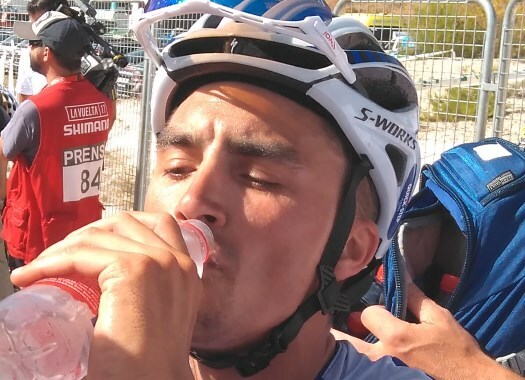 Alaphilippe also crossed the line at the top of the Col de la Colombiere on his own. In the peloton, Dan Martin (UAE Team Emirates) attacked during the last part of the climb but the group was compact again on the descent. The Frenchman of Quick-Step Floors crossed the finish line on his own and celebrated his second stage victory in a Grand Tour after winning the eighth stage at the 2017 Vuelta a España. Van Avermaet did an outstanding job in the stage and managed to retain the Yellow Jersey for another day.